Custom wood countertops are designed for use in many rooms throughout the home, including laundry rooms. They can be designed for the wash station area or for extra counter space. Wood countertops provide a naturally warm surface for folding and switching the wash. 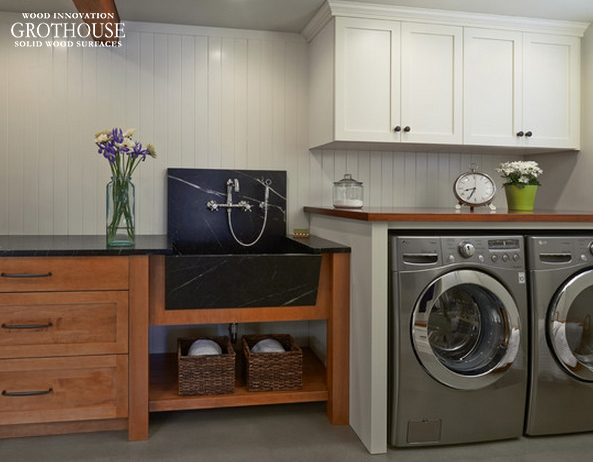 Some designers choose to combine an integrated mudroom and laundry room. For integrated spaces like that, a wood bench seat is often crafted for a warm place to sit. 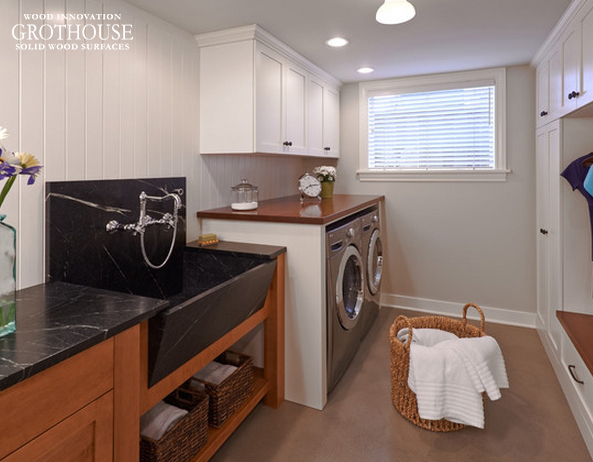 Collaborative Interiors designed this Seattle, Washington laundry room to include an African Mahogany wood countertop above the washer and dryer. Also designed was an African Mahogany bench seat for the built in cabinetry on the parallel wall. The warm, red tones of the wood compliment the cabinetry in the wash station area, as well as the wood ceiling beam. Standing out against the white wall of paneling and cabinetry, the counter makes for the perfect area to fold and stack clothing. It also provides extra counter space for laundry related items to be in reach. 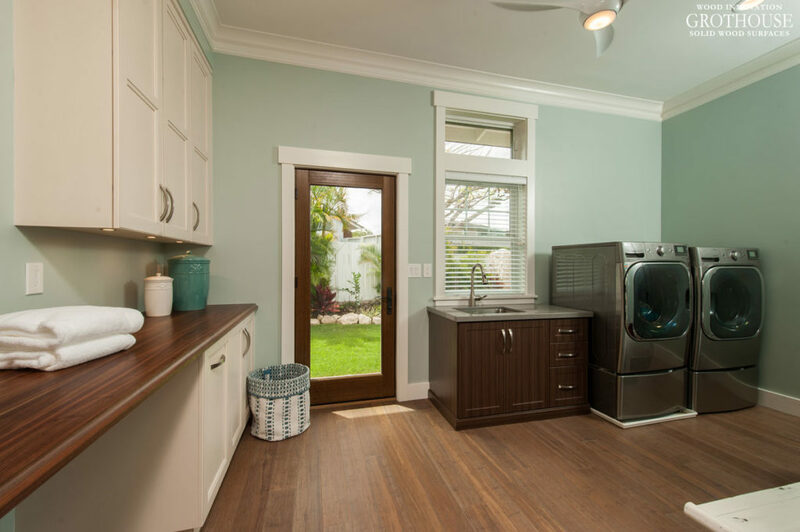 A bright laundry room with lots of efficiency was designed for this Hawaiian home. 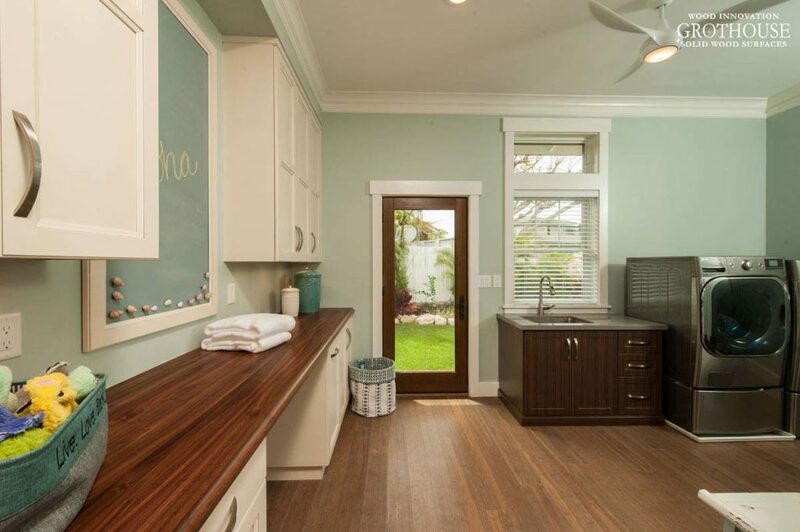 Archipelago Hawaii designed a countertop to run the entire length of the wall, offering plenty of counter space to complete laundry-related tasks. This large laundry room also offers an expansive run of custom cabinetry. 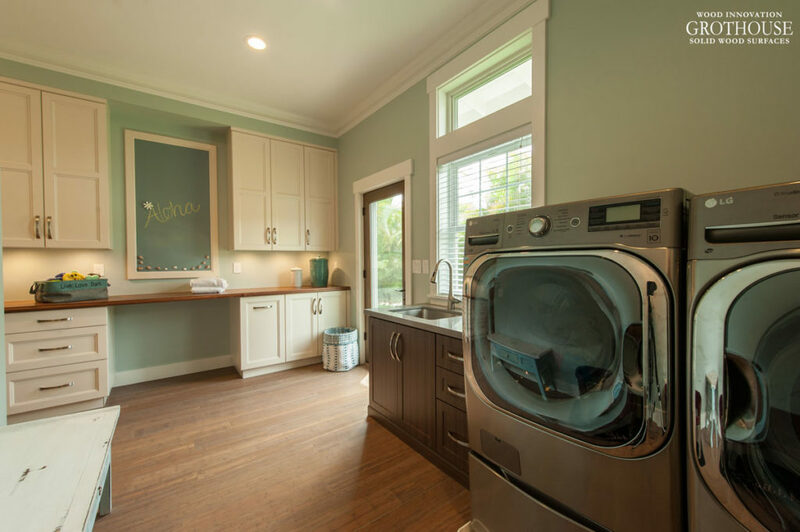 Interested in seeing more wood countertop designs for laundry rooms? Check out the Grothouse Image Library for more inspiration. Like us on Facebook for daily wood innovations. This entry was posted in custom wood countertops, Custom Wood Surfaces, wood countertop options, Wood Countertops, wood surfaces and tagged Countertop Ideas, custom wood countertops, Interior Decorating Wood Countertops, wood counter tops, Wood Countertops by Denise Grothouse. Bookmark the permalink.